November 10th in Wordpress Plugins by Wordpress Jedi . Most top blogs have Facebook, Twitter, Google+, LinkedIn, and other social media buttons installed. When adding these buttons to your site, you should make sure to optimize their code to avoid slowing down your site. Making your social share buttons attractive might also help your cause. Easy Social Share Buttons for WordPress happens to be a script with attractive buttons to grab the attention of your visitors. Easy Social Share Buttons supports 20 social networks and has 12 native social buttons that you can skin. You get Easy Template Customizer and 12 templates to get started. The plugin also gives you a lot of control as far as the location of the buttons is concerned. Webmasters can display these buttons on posts, pages, and post types. 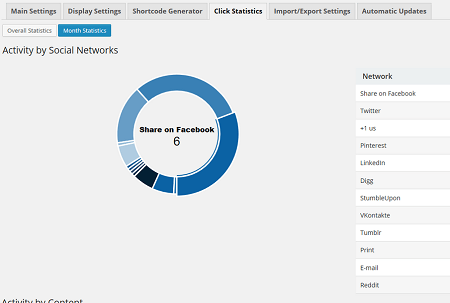 The plugin has a social fans counter. It has 8 counter styles and 3 button display styles. It provides support for Facebook, Twitter, Google+, YouTube, Vimeo, Behance, Pinterest, LinkedIn, and many other sites. You also get social metrics to monitor social activity across top social networks. The plugins offers Visual Composer integration. Easy Social Share Buttons is a premium plugin.